What time does the Night Tube start? I ask because somebody thinks this is important. You might think midnight, but it's not as simple as that. The issue's not about time so much as trains, all the trains up to a certain point being 'normal' and all those after that being 'Night Tube'. Actually it's not as simple as that either. This is a photo of the poster at Liverpool Street which purports to show the first and last eastbound trains on the Central line. It's been up for a week. Let's zoom in and look at just one part of it. I'll give you a moment to try to fathom it out. This says the 'last train' runs at 0040 six days a week, and at 2346 on Sunday. And then the first Night Tube service runs at 0040 on Fridays and Saturdays. This is a bit peculiar for two reasons. Firstly the 0040 is both the last train and the first Night Tube service, which doesn't seem right. And secondly, at weekends there isn't a last train, they run all through the night, so why say there is? Here's another example from the westbound poster. This time the last train on a Friday and Saturday night is at 0030, which is apparently also the time of the first Night Tube train. But again the peculiarity is that a last train is shown at all, because there isn't one, because that's the point of a 24 hour service. This confusion also stretches to the first train of the day. This runs at 0546 on weekdays, and apparently at 0538 on Saturdays and 0630 on Sundays. Meanwhile 0538 is also the time of the last Night Tube service on Saturdays, and 0630 is the time of the last Night Tube train on Sundays, whereas in reality the service just keeps on running and at weekends there isn't a first train at all. Last/first trains are also being doubled up in posters on the Victoria line, as here at Walthamstow Central. This table is necessarily more complicated, because on weekdays some late services only go as far as Seven Sisters, not the end of the line. But at weekends there isn't really a last train, except apparently it's at 0010, which is also the time of the first Night Tube service. I assume there must be a reason why TfL have insisted on splitting their first/last train tables into Night Tube and non-Night Tube sections. It might be for branding reasons, to make it really obvious to passengers that a Night Tube service runs. Or it might be because they deem it important to know precisely when the service switches from "every 2-5 minutes" to "every 10 minutes", and when it changes back. In this case, the 0010 train is indeed the the dividing line between a 5 minute evening service and the 10 minute Night Tube service. And yet all these posters have an asterisked note at the bottom which says "Early morning and late evening trains may run less frequently", which seems to have the whole thing covered. To finally answer the question I posed at the start - when is the first Night Tube train? - I've been to the ends of the Central and Victoria lines to look at the posters, and I've read off the changeover times. In every case these are the times of the last normal train which was running before the Night Tube started, so the first Night Tube train must be the next service after that, and by checking TfL's most recent set of working timetables I can deduce all the specific times. Which is kind of interesting. But if you stop and think for a minute, who cares? Your average tube punter doesn't care when the Night Tube starts, only that the tube runs through the night. Viewed objectively, trains start running early on a Friday morning and continue until Sunday evening, with no gaps inbetween. 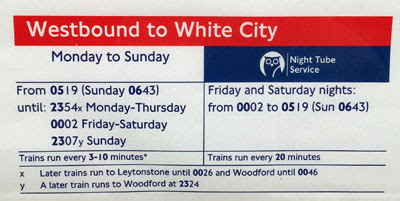 There are no last trains on a Friday or Saturday, and there are no first trains on a Saturday or Sunday. And yet TfL's posters insist there are. Indeed, they insist on making the whole palaver far more complicated than it really is. The same information could surely be displayed more clearly. Maybe a bit more like this? Or even cut down to this? 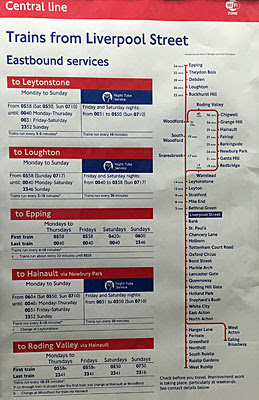 TfL decided several years ago that proper timetables were far too complicated for the average member of the public to understand, and now retain them only where services are particularly infrequent, for example on the Hainault Loop or on the outer reaches of the Metropolitan line. But what they serve up instead is deliberately more vague, and far less helpful, or indeed downright confusing. They'd prefer us to be looking at real time information, where this exists, which most of the time works fine. But for first and last trains the introduction of the Night Tube has made their presentation completely baffling, and all because somebody's decided on certain guidelines which must be followed. Bad information management with strict rules, like this, can be unnecessarily impenetrable to the public. And could, surely, be clearer.